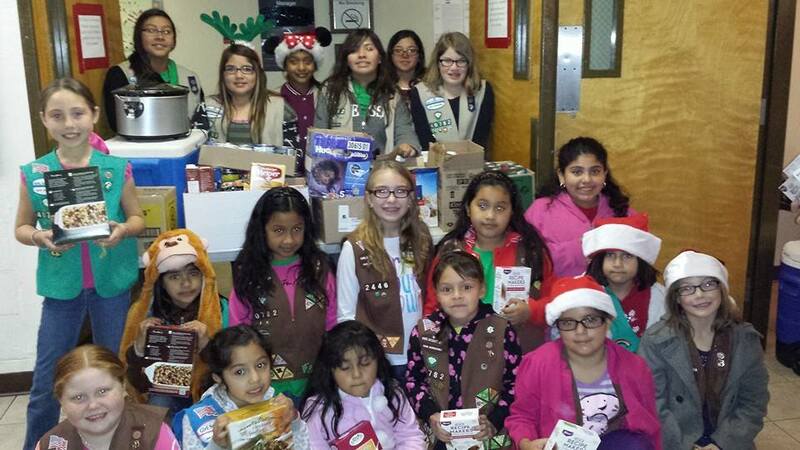 Girl Scout Troops 40782 and Troop 2446 serving Christmas dinner to Riverside shelters. Two Perris Girl Scout troops, Troop 40782 and Troop 2446, joined forces to serve two dinners to two shelters in a single night! 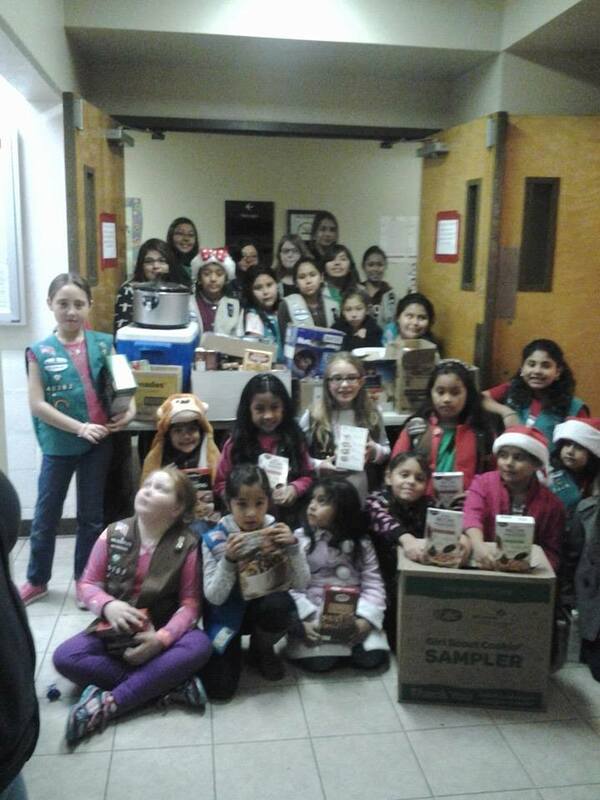 Troop 40782, led by Patricia Campos, is comprised of Girl Scouts Roxy, Allyson, Jessica, Cassandra, Melody, Marisa, Violet, Lily, Annalie, Karen, Karla, Ninette, Jasmin, Crystal, Morgan, Ashley, Janine, Kaitlyn, and Maggie; Troop 2446, led by Sonya Boyce, is smaller yet no-less formidable and is comprised of Girl Scouts Samantha, Rhianna, Jasmin, Keira, and Madison. “Over the summer Troop 40782 did a book drive for Path of Life’s summer youth program they were doing for the kids at there. We collected almost 300 books for the program. When we delivered the books we took a tour of the facility and the girls wanted to know how they could further help,” said Patricia Campos. With three months of planning behind them, the troops served spent December 21, 2013 cooking and serving delicious meals to over 100 people. “We were very impressed with the girls tonight, they did an awesome job. They made me proud that I was a Girl Scout!” exclaimed Dionne Angeles, a service staff member at Path of Life’s family shelter. The troops initally planned to serve dinner and do crafts at Path of Life Ministries family shelter in Riverside, but due to the overwhelming generosity of families throughout Lake Elsinore, Perris and Canyon Lake, the girls found themselves with a bounty of nine turkeys, fifteen pies and over 350 canned goods. Blessed with this surprising wealth of food, the troops extended their mission to the neighboring United States Veteran’s shelter. The shelters are located across the street from another on March Air Reserve Base; Path of Life Ministry is a temporary housing shelter for homeless women and children and the other is a shelter for homeless military veterans. 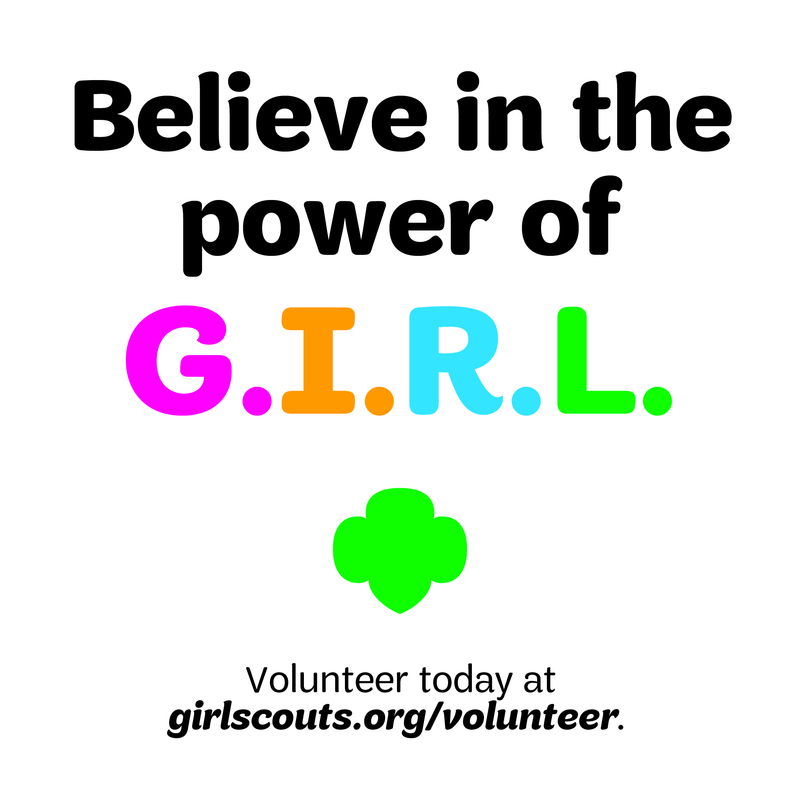 David Cornelious, a United States Army Veteran, said, “I love that the girls do so much for their community.” Mr. Cornelious proudly added that his own daughter was a Girl Scout troop leader for his granddaughter in Arizona. “The vets were all such wonderful, grateful people. The highlight of the night was when the men unexpectedly erupted into applause thanking the girls for the food and their service. 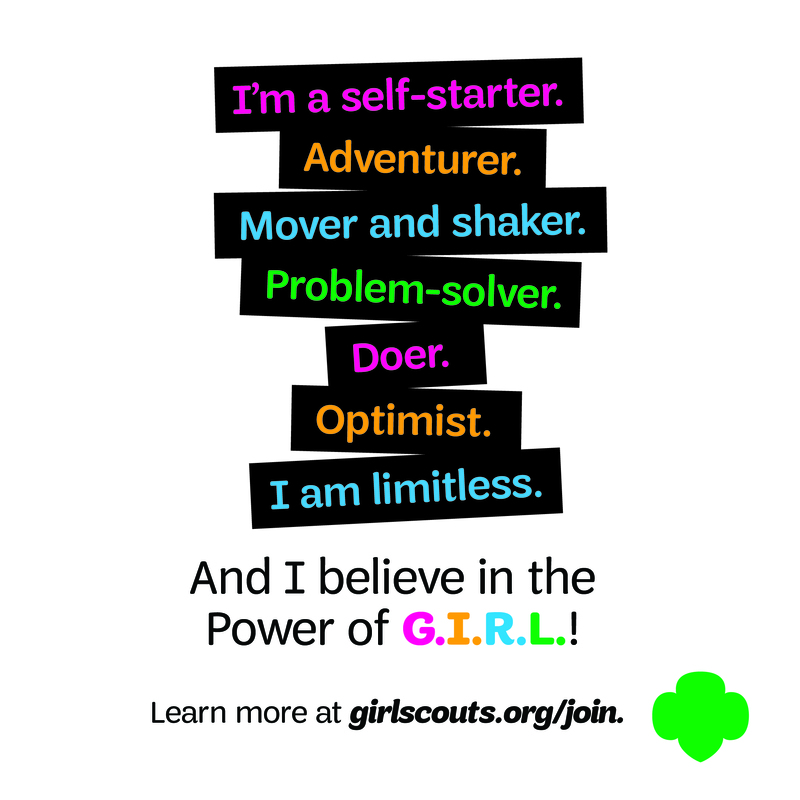 It was a very special and emotional moment that made all the hard work worthwhile,” said Sonya Boyce, Girl Scout Leader of Troop 2446. All of the donated food was cooked with love at the girls’ parents’ houses. The hot food was quickly rushed to the shelters and residents at both facilities enjoyed turkey with gravy and cranberry sauce, mashed potatoes, stuffing, corn, green beans, and dinner rolls. For dessert, the Girl Scouts provided apple and pumpkin pies. Girl Scouts Amanda and Courtney from Troop 126 also volunteered with serving dinner and supervising crafts for younger kids at the family center. 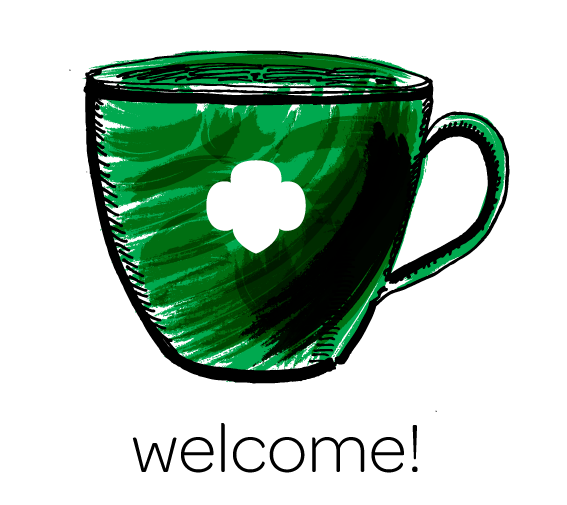 Next Next post: Girl Scouts Partner with Children’s Fund to host Kids Helping Kids toy drive!